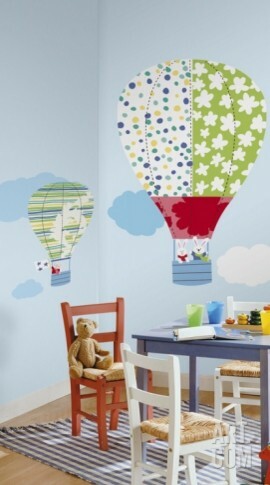 If you are stuck for nursery ideas, hot air balloon decorations create a fun feel that will entertain your child for years. One of the biggest challenges of decorating a nursery is finding a theme that will grow with your child. No one wants to spend months creating a nursery theme only to have to remodel a few months after the baby is born. So many nursery themes feature things like rocking horses, or pale blue or pink teddy bears. These are cute for the initial months, but once your child is a toddler, it will no longer make sense. If you can choose something in bright, primary colors that includes images that will hold their interest for a few years, you will save time and money in the long run. If you are just beginning to decorate the nursery, start by choosing your paint colors. 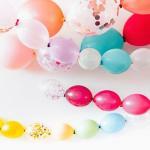 Typically, hot air balloon decorations are in rainbow colors like red, blue, green, and yellow. You can choose one of these colors for the nursery, or if you think them too bold, choose a neutral like white or beige. You can then fill in with accents like primary blue or red curtains, or furniture painted green or yellow. 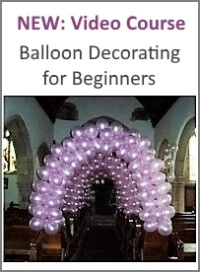 You can also search for balloon specific decorations that are in non-primary shades, but those may be tough to find. Once the basics are done, search for accessories. 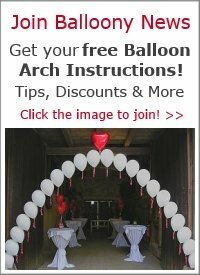 One of the most popular hot air balloon decorations are mobiles. They are great for babies because they are interesting and visually stimulating. You can get ready-made ones in a variety of styles and materials, or you can try your hand at making one yourself. 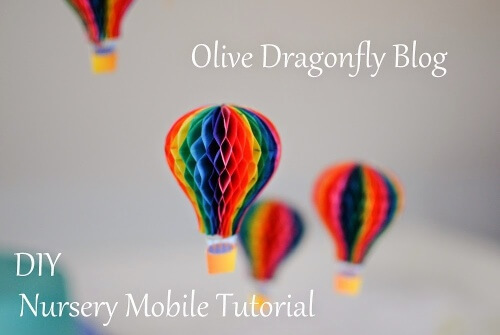 Bex from the Olive Dragonfly Blog published a DIY tutorial for creating this beautiful hot air balloon mobile in the picture below. If you are not that crafty, take a look at this awesome ready-made mobile from Schylling. It consists of 10 uniquely painted hot air balloons made of tin. 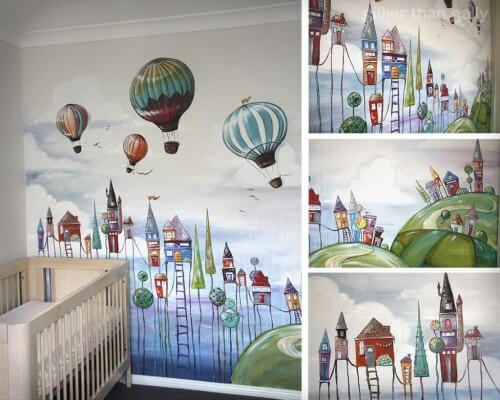 Consider a mural if the nursery features a wall without windows or a closet. You can print hot air balloon clip art from the Internet onto transparency paper and then borrow a projector from the library or local school to project the image onto the wall. Trace the image and then paint in the lines with the colors you chose for the theme. This is a great way to bring those primary balloon colors onto the walls without committing to an entire wall of a solid, bright color. An easier (and removable) alternative to murals are stick and peel wall decals. These self adhesive stickers allow you to create a lovely wall decoration without having to be an artist. And if you don't like them anymore, no problem, you peel them off the wall. You can even re-use them in another location. Finally, you can also look for hot air balloon pictures to frame and hang on the walls. Perhaps you've been to a hot air balloon event and took some good shots yourself? If not, there's a huge selection at Art.com, my favorite online shop for posters and prints. Choosing a theme for your child's nursery can be a challenge. The popular themes are often cute but do not age well with the child. Sometimes, they are clearly gender oriented and you may not be able to find something you like that is suitable for your baby. You may also find other people are unaware of your theme and give you gifts that are generic or inappropriate. 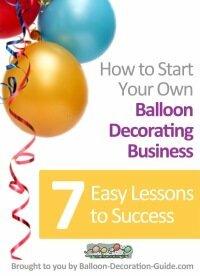 If you are looking for a fun way to decorate your nursery, let everyone know you would like hot air balloon decorations or gifts, and get to work creating an ageless, bright nursery for your child. Interested in a Hot Air Balloon Coloring Picture?